Wildlife Artists, Inc. is dedicated to making exceptional stuffed animals with realistic details and accurate features. Their wonderful line of Conservation Critters are available in all kinds of wildlife, from North American stuffed animals to animals from the Land Down Under. 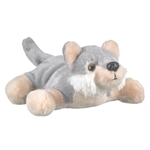 Most of the styles of plush Conservation Critters are available in two or three different sizes that can be teamed together to make adorable plush families. Are you looking for jumbo stuffed animals? Well, you're in luck! Wildlife Artists produces some fantastic over-sized stuffed animals like the 24 Inch Stuffed Sea Otter and the 67 Inch Stuffed Spotted Eagle Ray. To see all of the jumbo stuffed animals by Wildlife Artists just sort the pages below by price from high to low. Not looking for something quite that big? No problem, the large Conservation Critters range in size from 15 to 28 inches and are just $20.99. That's a lot of animal for a low price! Wildlife Artists has a stuffed animal for everyone. The small Conservation Critters are only $6.99, measure eight to ten inches, and definitely make up for their smaller size with huge personalities. Somewhere in the middle, there are the $13.99 Conservation Critters that are anywhere from 12 to 20 inches in size. Not too big and not too small, these medium sized plush animals are an armful of joy. With so many sizes and styles to choose from there is sure to be a perfect Wildlife Artists stuffed animal for everyone!